Rainy season is almost over and the cicadas are out. They were late last year, probably because the rainy season was unseasonably (har) long. It's weird when you realize something is missing. It's not like there's a set date for them to come out so it was a while before we figured out they weren't around. But last year tensions were pretty high in Japan on the subject of nature. The cicadas being out and serenading us nightly to me is a sign that things are on the up, naturewise, on this archipelago. I looked for a short story this week that is about cicadas. I came across this one from scifi teen queen Belle Whittington, entitled Cicada Holiday. It's memories of a good Christmas for Blair, about her family and love interest. Not really what I was looking for, but you know I love cold stories in the summer like a good Japanese girl should (har har). The story is simple enough, just good memories. The sights, sounds, and smells of a holiday. The feeling of anticipation and sharing things with those you love. The secrets people keep to give each other surprises. It could be anyone's memories. But the intriguing part comes at the end, when we realize Blair's life isn't like this anymore, that it's just a part of the past she needs to hang onto. That's when you are drawn in and want to read more. It looks like this short story is a bonus for fans of Belle Whittington's Cicada series. There isn't much character development because, I think, it is assumed fans already know Blair and Bug Boy and Andrew. I love when authors do this, and I think it's more common in the YA realm than elsewhere. So nice when we get a teaser of a next novel while waiting, that gives us the anticipation normally reserved for Christmas. I'll be looking for Cicada based on this story, so a great choice of the author to bring in new readers too! 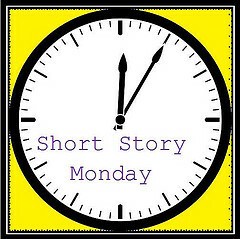 This is my contribution to this week's Short Story Monday, hosted by John at The Book Mine Set. Howdy from Texas! Thanks to Google Alerts, I got a chance to see your post about my "Cicada Holiday Short Story"! Many warm thanks for the lovely post about my short story and book! :-) It's so exciting to read such an awesome post on such an awesome blog! Thanks so much for commenting. I just ordered Cicada for my Kindle, can't wait to start on it. I am very interested in the extraterrestrial aspect. It doesn't really sound like my kind of story but I certainly get the appeal of reading winter stories in the summer. I have a cold wet towel around my neck with the fan blowing on me right now. LOL! It's supposed to be cooler over there! Nothing like a winter story and a popsicle to cool you off in record high temps. No cicadas in my area yet! I noticed they were missing a few days ago.. wondering if they'll be around soon. Hope they do show up soon! We are so much farther south that our seasons are a little earlier I think.